Dr. Phillip Chan, CEO of CytoSorbents, explains his company’s innovative products, ongoing clinical trials, funding and future goals. CytoSorbents (NASDAQ:CTSO) CEO Dr. Phillip Chan says his company has blended benefits with the risk profile of a medical device company and the upside of a biotechnology company. Already on the market in Europe since 2013, CytoSorb treats deadly inflammation and life-threatening illnesses such as sepsis, burn injury, trauma, cytokine release syndrome and cancer immunotherapy; it’s also used in cardiac surgery. The product works by filtering blood from patients with the help of a hemodialysis machine. Porous polymer beads purify the blood, removing dangerous toxins that cause inflammation, among other deadly issues. Consequently the blood is returned to the patient’s body. Chan said the goal is to prevent these issues in the post-operative period, while speeding recovery. REFRESH 2-AKI has enrolled about 39 patients, with a target of completing the trial by 2020 and reaching FDA approval by 2021 to treat or reduce the severity of severe acute kidney injury. Aside from that clinical trial, the company has multiple other ongoing trials. One of these is a 250-patient German government-funded REMOVE endocarditis trial with CytoSorb. An interim analysis on inflammatory mediators will be released this month on the first 50 patients enrolled. This isn’t all that Chan spoke about — listen to the audio above to see what else is going on with CytoSorbents. The transcript for the interview is available below. INN: Here with the Investing News Network, I’m Gabrielle Lakusta at the Biotech Showcase in San Francisco. Today I’m speaking with the CEO of CytoSorbents, Phil Chan. Thank you for being here today. PC: Well, Gabrielle, thank you very much for taking the time to meet with me. INN: So, I saw your presentation earlier today, but for investors who weren’t able to make it out, can you give a quick rundown of the company and what went on during the presentation? PC: Sure. Maybe just at first, let me introduce myself. I’m Dr. Philip Chan, I’m the CEO of CytoSorbents. I’m an MD, PHD internal medicine physician by background, having trained at both Yale and Harvard. And have now been the CEO of CytoSorbents for the past decade. In that period of time we’ve been able to bring our flagship product CytoSorb to the market now in Europe and in 53 countries around the world. As a blood purification strategy to treat deadly inflammation, life-threatening illnesses like sepsis, burn injury, trauma, cytokine release syndrome and cancer immunotherapy. As well as being used in cardiac surgery today. INN: Thank you. Now going into your main focus, which is your product. From your presentation, it seemed like there’s a lot of research going on in Europe — it’s very big and you’re hoping to make the transition to make it just as big, and even bigger here in the US. Is that correct? PC: Yeah that’s correct. So, CytoSorb was approved and has commercialized in the European Union, the first full year of commercialization was 2013. And we’ve now grown sales of CytoSorb to that, a little more than $20 million. And now with more than 56,000 human uses, human treatments, over that period of time. And so, in the United States, we’re actively looking to get CytoSorb approved in the United States through the second, one of our verticals. So, the first major vertical is critical care and the treatment of life-threatening illnesses like sepsis. That’s roughly three quarters of the cases that have been done to date. But cardiac surgery represents another major market, and that is currently the focus of getting CytoSorb approved in the United States. And we’re currently running a 400-patient randomized control pivotal trial called Refresh 2-AKI. Using CytoSorb during high-risk cardiac surgery, while the surgery’s ongoing, where CytoSorb is installed into a bypass circuit in a heart lung machine, to actively purify inflammatory toxins that are being generated during surgery. That could otherwise cause organ damage and organ failure post operatively, and cause a whole host of complications such as acute kidney injury, stroke, human dynamic instability as well as respiratory failure. By cleaning these things up by using a Brita filter for your blood — that’s what people often call our product — the goal is to try to prevent these things from happening in the post-operative period and make that post-operative recovering much smoother. So our Refresh 2-AKI is currently underway, about 39 patients enrolled and with a target of completing that trial by 2020 and hopefully approved as a therapy to potentially treat or reduce the severity of acute kidney injury by 2021. INN: Thank you. Now your company is very unique in the sense that your product is approved in the European Union already and you do have revenues incoming, so what are some advantages or disadvantages of this? PC: Well, the great part of being a revenue-based company is the fact that our revenues have been growing higher, and as we’ve been expanding our product gross margins higher, currently they’re at 72 percent, but on a blended basis mixing higher-margin direct sales and lower-margin distributor partner sales, but we expect that to actually go to 80 percent this year on a quarterly basis. That is producing a lot of cashflow that we can not only use to offset our operating business but also to drive gap profitability — a lot of biotech and medical device companies can’t say that. 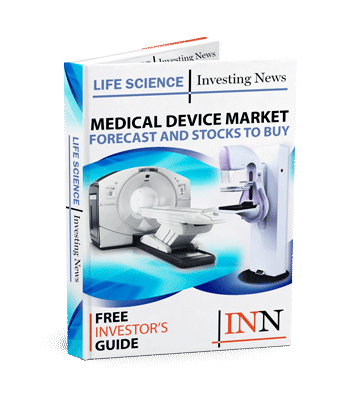 In fact, a lot of medical device companies, the more they sell the more they lose. Yet for us, we can actually achieve what we believe is gap profitability in the next couple years on a relatively low-revenue basis of the high-margin disposable business model that we have. And for biotech companies, these companies are often spending tens of millions of dollars a quarter running these massive clinical trials with the hope of getting approved. On the other hand, we are running much smaller studies because we can do that with medical devices and we’re not using those trials for approval. We’re using those trials to drive data that will drive adoption usage, reimbursement and other things. And so it is a nice place to be. INN: And now with the focus here in the US right now with the FDA, what other expansion could we see in the future with the company? PC: Our first goal is to get Cytosorb approved in the US for the application of cardiac surgery, and we plan to try to expand the label to other life-threatening illnesses like sepsis and other things over time. In the meantime, we have another product called HemoDefend and this is a product, unlike Cytosorb, which is taking your blood out of your body, purifying it and returning it back to you. HemoDefend is actually a product designed for the blood-transfusion industry, HemoDefend is a point-of-care, point-of-transfusion filter that is designed to remove the non-infectious contamins from transfused blood products like packed red blood cells (pRBCs) that can, like antibodies, cytokines, bioactive lipids, potassium and many other things, that can otherwise cause transfusion reaction in susceptible people. And some of those times that can be life threatening, so this is a program that was funded by the National Health Lung and Blood Institute, a division of NIH as well as US Special Operations Command, as a way to try to improve the quality and safety of the blood supply. And we are now nearing a human pivotal trial and hope to get HemoDefend approved on the US market by late 2019 or early 2020. INN: Okay, so aside from this, and the clinical trial finishing up, hopefully to reach approval in 2020, what are some other milestones that investors may want to look forward to in the next couple years? PC: I think that there are going to be a lot of catalysts for our company. We’ve already demonstrated a very solid track record of growth over the years. We made the Deloitte Fast 500 for the second year in a row, which is a list of the fastest-growing companies in North America across all industries, and we’ve demonstrated the ability to grow with a compound annual growth rate of about 71 percent over the last several years. But we believe that we’re just scratching the surface of the market opportunity. This is really a $20-billion opportunity in critical care and cardiac surgery, and we have respectable revenue of $20 million. But again, just scratching the surface of this opportunity. So, we believe that we are at the beginning of a multi-year growth story, where we have the potential to grow even faster than we have been, and that will be a very exciting time for us. And we’re just investing to be able to drive that growth. INN: Thank you, and are there any other final points you want investors to know about the company or the device or anything? PC: I think that we’re one of those unique companies that has the ability to not only save lives, but also a very significant investment for those involved. Because it is such a highly profitable business model, that has the potential at the end of the day once we hit gap profitability to drop $0.50 on every dollar in sales to even out. And we believe that this would place us in a very unique category of medical device companies as well as biotechnology companies with that kind of cashflow and that kind of type of profitability. We always like to say that we have the risk profile of a medical device company, but really the upside of a biotechnology company because of the massive markets that we serve. And so hopefully time will tell and we’ll be able to prove that out.